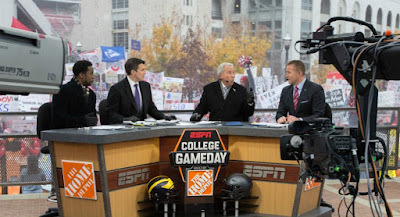 One of my favorite sports shows on TV is ESPN's College Game Day on Saturday mornings during the NCAA college football season. In 2017 the panel of Lee Corso, Kirk Herbstreit, Desmond Howard, Reece Davis and David Pollack will be awesome as usual with their fun banter and great information about the games taking place during the weekend. The College Game Day crew will go to a certain college campus, usually where there is a big game about to occur where that school is the home team. They bring much recognition to the campus and the school and that's why fans of their school love to have the College Game Day crew come to their town. Well, I have a suggestion and a plea for the ESPN great College Game Day crew to come to Houston on Sept. 16, 2017 for the College Game Day show. The city of Houston has just faced a devastating Hurricane, Hurricane Harvey, that has hit our city which some call a once in thousand year event. Many homes and cars were destroyed and more tragically lives were lost as Houston begins its recovery. We thank all of those across the nation for their gracious help to Houston, in prayer and funds and even in people coming down here to help. May God Bless you! Wouldn't it be great ESPN to help give Houston a boost by bringing Game Day here on September 16-a game not just between two Houston college teams, Rice and the University of Houston [to be held at U of H's TDECU Stadium at 7:00 CT] but it will be the first game in the city for both teams [since the Hurricane]. What a welcome back to both college teams in Houston, especially if the College Game Day crew could also be here. Come on Desmond and Rece and Lee and Kirk and David, and ESPN - bring your College Game Day to the University of Houston campus on September 16, 2017! Please everyone sign this petition to bring the College Game Day to Houston.